Over 2 million Muslim faithful, including 1.68 million from abroad, are ready to take part in the annual hajj pilgrimage in Saudi Arabia. 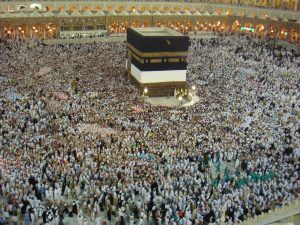 The holy pilgrimage is once-in-a-lifetime experience for many Muslims. During the hajj, the pilgrims retrace the route the Prophet Mohammad took 14 centuries ago. The pilgrimage and is required of all able-bodied Muslims once in their life. Men dress in seamless white terrycloth garments meant to represent unity among Muslims and equality before God. Women cover their hair, wear loose clothing, and avoid makeup and nail polish to represent humility and spiritual purity. The hajj itinerary begins with prayers in Mecca while circling the cube-shaped Kaaba, which represents the metaphorical house of God and the oneness of God in Islam. Then, the pilgrims will travel to Mount Arafat, the location of the Prophet Muhammad’s final sermon. From there, the pilgrims will collect pebbles on the way to Muzdalifa to participate in a symbolic stoning of the devil. The last part of the hajj involves male pilgrims shaving their hair and women cutting a lock of hair in a sign of renewal. The Eid al-Adha holiday will mark the end of hajj, with Muslims partaking in the slaughter of sheep and cattle and distributing the meat to the poor. Saudi Arabia takes its management of the holiest sites in Islam very seriously, spending billions of dollars of its substantial oil revenues on security and safety measures. The country is now using technology, such as electronic identification bracelets connected to GPS, to manage the flow of millions traveling through the same places at the same time. The country has also created apps to help pilgrims navigate the haj itinerary more efficiently. The country has also improved transportation for the pilgrims. Minister of Haj and Umrah Mohammed Bintin said in an interview, “We have a fleet of more than 18,000 buses, all of them linked to a control system that tracks their path.” A high speed railway between Mecca and Medina has been completed, according to his statement, and is now in a testing phase.